It was an early start for a small group of supporters of the City of London Anti-Apartheid Group on Saturday 12 October 1989. They travelled to Leicester to participate in a demonstration in support of Ross Galbraith and Gary Sherriff, two workers who had been sacked from their jobs at a local plastics factory for refusing to work on an order destined for South Africa. Led by Ross and Gary, with their union banner, the demonstration wound through the streets of the city to the gates of Granby Plastics in the north of the Leicester. City Group applauds Ross and Gary’s stand as workers against British trade with apartheid and urges all our members, supporters and all sections of the British working class and Trade Union movement to show their solidarity and support for the stand and the personal sacrifice they have made. (Non-Stop Against Apartheid, 36, page 4). 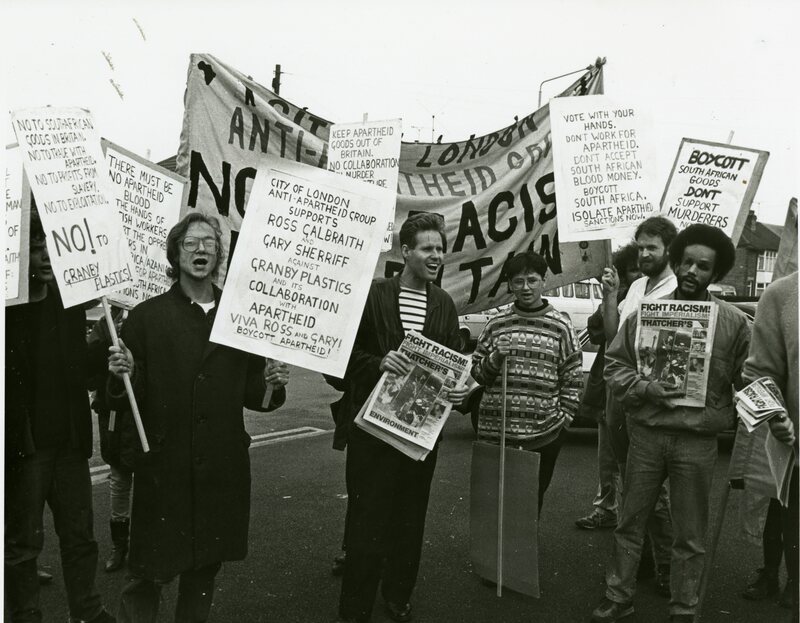 City Group chose to make the South African Embassy in London the focus for its anti-apartheid campaigning, but it used the Non-Stop Picket and its publications to publicise and support other militant campaigns against British collaboration with apartheid. Although City Group participated in a number of national initiatives designed to mobilise for workers’ sanctions against apartheid, this was never an area in which City Group played a key role. The Non-Stop Picket attracted predominantly young participants, few of whom were active trade unionists. Even those City Group members who were active in their trade unions tended not to work in sectors where workplace action against apartheid was likely to be viable or effective. While City Group did what it could to support militant workplace action by workers like Ross and Gary in Leicester; for the most part, its trade union work did not extend much further than attempting to mobilise trade union members to support the group’s demonstrations and campaigns. City Group’s campaigning was primarily located on the streets of London rather than in the workplace. That was both its strength and its limitation. This entry was posted in Archival research and tagged City of London Anti-Apartheid Group, Leicester, Leicester & District Trades Union Council, trade unions, workers' sanctions. Bookmark the permalink.